LDF Coatings patented electroless nickel plating process ELIMINATES tin whiskers by depositing a thin layer of nickel onto the tin surfaces of the electronic assembly. LDF Coatings claims not just mitigation but prevention of tin whisker growth in electronic assemblies. With no risk of whisker-related system malfunction, there's no need to screen parts to prevent the use of tin-plated terminations in your product. Screening to reject lead-free components is not only expensive, but it also risks mix-ups, damage due to handling, and components that escape screening. There is no way to prevent the use of tin plated components if COTS assemblies are used in your systems. Replating component terminations with tin-lead risks introducing latent damage from exposure to heat. Electroless plating is well established for bare board fabrication, and has been used in other industries for over half a century. The LDF process deposits a thin, whisker-impenetrable layer of nickel on all exposed tin and tin-rich surfaces, but not on the insulating surfaces, of a functional electronic assembly. This selective deposition is accomplished by immersing the assembly in a heated tank of electroless plating solution for a few minutes. While immersing a functional assembly in a plating solution is novel, we show that with proper process control it is not risky. Any assembly that can survive aqueous post-solder cleaning is unharmed by this immersion. Metal surfaces that are not to be coated are masked in the same manner as they are for conformal coating. The current industry approach to tin whisker mitigation is conformal coating, which uses a material selected from a variety of polymers (formulated and characterized for a different purpose—namely prevention of dendritic growth on the board surface). For high-reliability systems, there are significant downsides to conformal coating as a tin whisker remedy. Some commercially available conformal coatings resist whisker penetration. However, in tests, all are penetrated over time. Due to shadowing, some tin remains uncoated. Due to surface tension, coating along sharp edges of component terminations tends to be quite thin, which accelerates tin whisker penetration. Conformal coating materials are polymers, so regardless of which is chosen, their properties are not constant but vary with time, temperature, and humidity. No coating material has been characterized for its whisker-penetration resistance over the full range of temperature and humidity that electronic products encounter in the field. Whatever the choice of coating, it deteriorates over the years during which it is expected to protect the assembly. Nickel cap properties are invariant over time, temperature, and humidity. Measured in just tens of nanometers, the electroless nickel-cap plating resists tin whisker penetration in the field forever. Sufficient nickel-cap thickness is produced in just a few minutes of immersion. The nickel plating is far too thin to interfere with solder rework. Surface insulation resistance is unaffected by the amount of time that the assembly is immersed in the electroless plating solution. The nickel deposition process imparts superior corrosion resistance to the entire assembly. With ordinary process control, imposes zero risk of damage to your products. 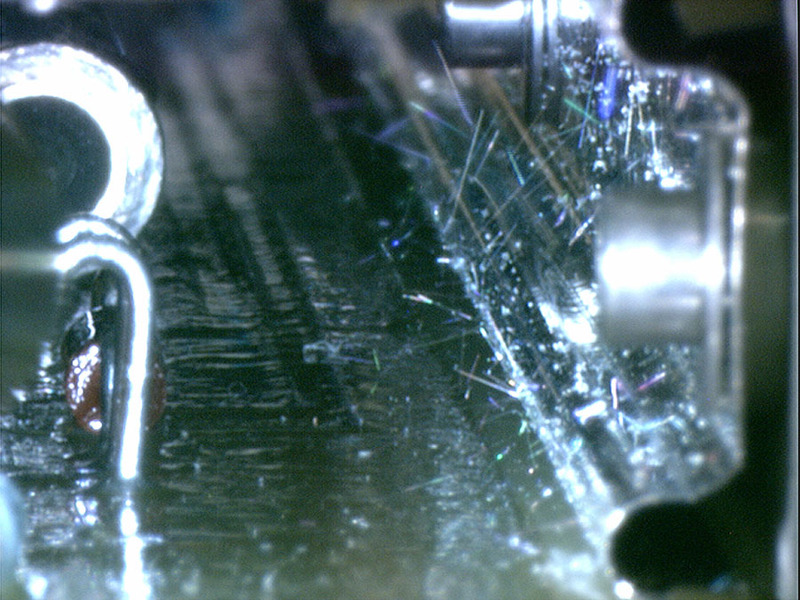 If you want to explore how our patented process can eliminate your tin whisker problem, we welcome the opportunity to discuss with you what we regard as the only true remedy available for overcoming the risk of whisker-caused failures in high-reliability electronic assemblies.